For other uses, see Normandy (disambiguation). Normandy (/ˈnɔːrməndi/; French: Normandie, pronounced [nɔʁmɑ̃di] ( listen), Norman: Normaundie, from Old French Normanz, plural of Normant, originally from the word for "northman" in several Scandinavian languages) is one of the 18 regions of France, roughly referring to the historical Duchy of Normandy. Normandy is divided into five administrative departments: Calvados, Eure, Manche, Orne, and Seine-Maritime. It covers 30,627 square kilometres (11,825 sq mi), comprising roughly 5% of the territory of metropolitan France. Its population of 3.37 million accounts for around 5% of the population of France. The inhabitants of Normandy are known as Normans, and the region is the historic homeland of the Norman language. The historical region of Normandy comprised the present-day region of Normandy, as well as small areas now part of the departments of Mayenne and Sarthe. The Channel Islands (French: Îles Anglo-Normandes) are also historically part of Normandy; they cover 194 km² and comprise two bailiwicks: Guernsey and Jersey, which are British Crown dependencies over which Queen Elizabeth II reigns as Duke of Normandy. 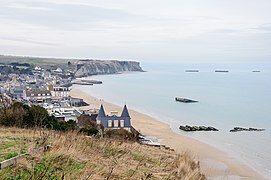 Normandy's name comes from the settlement of the territory by mainly Danish and Norwegian Vikings ("Northmen") from the 9th century, and confirmed by treaty in the 10th century between King Charles III of France and the Viking jarl Rollo. For a century and a half following the Norman conquest of England in 1066, Normandy and England were linked by Norman and Frankish rulers. Archaeological finds, such as cave paintings, prove that humans were present in the region in prehistoric times. Celts (also known as Belgae and Gauls) invaded Normandy in successive waves from the 4th to the 3rd century BC. When Julius Caesar invaded Gaul, there were nine different Celtic tribes living in Normandy. The Romanisation of Normandy was achieved by the usual methods: Roman roads and a policy of urbanisation. 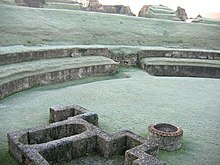 Classicists have knowledge of many Gallo-Roman villas in Normandy. In the late 3rd century, barbarian raids devastated Normandy. Coastal settlements were raided by Saxon pirates. Christianity also began to enter the area during this period. In 406, Germanic tribes began invading from the east, while the Saxons subjugated the Norman coast. As early as 487, the area between the River Somme and the River Loire came under the control of the Frankish lord Clovis. Vikings started to raid the Seine valley during the middle of the 9th century. As early as 841, a Viking fleet appeared at the mouth of the Seine, the principal route by which they entered the kingdom. After attacking and destroying monasteries, including one at Jumièges, they took advantage of the power vacuum created by the disintegration of Charlemagne's empire to take northern France. The fiefdom of Normandy was created for the Viking leader Hrólfr Ragnvaldsson, or Rollo (also known as Robert of Normandy). Rollo had besieged Paris but in 911 entered vassalage to the king of the West Franks, Charles the Simple, through the Treaty of Saint-Clair-sur-Epte. In exchange for his homage and fealty, Rollo legally gained the territory which he and his Viking allies had previously conquered. The name "Normandy" reflects Rollo's Viking (i.e. "Norseman") origins. To this day, in Norwegian language the word nordmann (pron. Norman) denotes a Norwegian person. The descendants of Rollo and his followers adopted the local Gallo-Romance language and intermarried with the area's native Gallo-Roman inhabitants. They became the Normans – a Norman-speaking mixture of Norsemen and indigenous Franks, Celts and Romans. 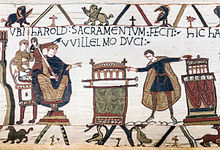 Rollo's descendant William became king of England in 1066 after defeating Harold Godwinson, the last of the Anglo-Saxon kings, at the Battle of Hastings, while retaining the fiefdom of Normandy for himself and his descendants. Besides the conquest of England and the subsequent subjugation of Wales and Ireland, the Normans expanded into other areas. Norman families, such as that of Tancred of Hauteville, Rainulf Drengot and Guimond de Moulins played important parts in the conquest of southern Italy and the Crusades. The Drengot lineage, de Hauteville's sons William Iron Arm, Drogo, and Humphrey, Robert Guiscard and Roger the Great Count progressively claimed territories in southern Italy until founding the Kingdom of Sicily in 1130. They also carved out a place for themselves and their descendants in the Crusader states of Asia Minor and the Holy Land. The 14th-century explorer Jean de Béthencourt established a kingdom in the Canary Islands in 1404. He received the title King of the Canary Islands from Pope Innocent VII but recognized Henry III of Castile as his overlord, who had provided him aid during the conquest. In 1204, during the reign of John Lackland, mainland Normandy was taken from England by France under King Philip II. Insular Normandy (the Channel Islands) remained however under English control. In 1259, Henry III of England recognized the legality of French possession of mainland Normandy under the Treaty of Paris. His successors, however, often fought to regain control of their ancient fiefdom. 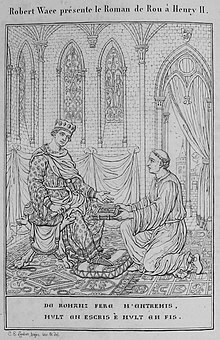 The Charte aux Normands granted by Louis X of France in 1315 (and later re-confirmed in 1339) – like the analogous Magna Carta granted in England in the aftermath of 1204 – guaranteed the liberties and privileges of the province of Normandy. French Normandy was occupied by English forces during the Hundred Years' War in 1345–1360 and again in 1415–1450. Normandy lost three-quarters of its population during the war. 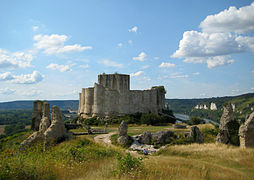 Afterward prosperity returned to Normandy until the Wars of Religion. When many Norman towns (Alençon, Rouen, Caen, Coutances, Bayeux) joined the Protestant Reformation, battles ensued throughout the province. In the Channel Islands, a period of Calvinism following the Reformation was suppressed when Anglicanism was imposed following the English Civil War. Samuel de Champlain left the port of Honfleur in 1604 and founded Acadia. Four years later, he founded Québec City. From then onwards, Normans engaged in a policy of expansion in North America. They continued the exploration of the New World: René-Robert Cavelier de La Salle travelled in the area of the Great Lakes, then on the Mississippi River. Pierre Le Moyne d'Iberville and his brother Lemoyne de Bienville founded Louisiana, Biloxi, Mobile and New Orleans. Territories located between Québec and the Mississippi Delta were opened up to establish Canada and Louisiana. Colonists from Normandy were among the most active in New France, comprising Acadia, Canada, and Louisiana. 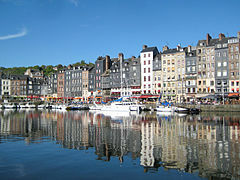 Honfleur and Le Havre were two of the principal slave trade ports of France. Although agriculture remained important, industries such as weaving, metallurgy, sugar refining, ceramics, and shipbuilding were introduced and developed. In the 1780s, the economic crisis and the crisis of the Ancien Régime struck Normandy as well as other parts of the nation, leading to the French Revolution. Bad harvests, technical progress and the effects of the Eden Agreement signed in 1786 affected employment and the economy of the province. Normans laboured under a heavy fiscal burden. In 1790 the five departments of Normandy replaced the former province. 13 July 1793, the Norman Charlotte Corday assassinated Marat. The Normans reacted little to the many political upheavals which characterized the 19th century. Overall they warily accepted the changes of régime (First French Empire, Bourbon Restoration, July Monarchy, French Second Republic, Second French Empire, French Third Republic). There was an economic revival (mechanization of textile manufacture, first trains...) after the French Revolutionary Wars and the Napoleonic Wars (1792–1815). And new economic activity stimulated the coasts: seaside tourism. The 19th century marks the birth of the first beach resorts. During the Second World War, following the armistice of 22 June 1940, continental Normandy was part of the German occupied zone of France. The Channel Islands were occupied by German forces between 30 June 1940 and 9 May 1945. The town of Dieppe was the site of the unsuccessful Dieppe Raid by Canadian and British armed forces. 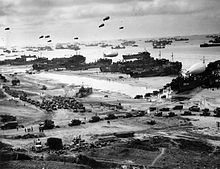 The Allies, in this case involving Britain, the United States, Canada and Free France, coordinated a massive build-up of troops and supplies to support a large-scale invasion of Normandy in the D-Day landings on 6 June 1944 under the code name Operation Overlord. The Germans were dug into fortified emplacements above the beaches. 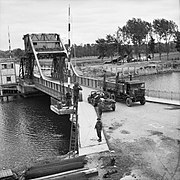 Caen, Cherbourg, Carentan, Falaise and other Norman towns endured many casualties in the Battle of Normandy, which continued until the closing of the so-called Falaise gap between Chambois and Mont Ormel. The liberation of Le Havre followed. 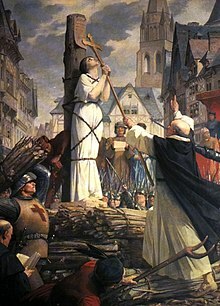 This was a significant turning point in the war and led to the restoration of the French Republic. The remainder of Normandy was liberated only on 9 May 1945 at the end of the war, when the Channel Island occupation effectively ended. Between 1956 and 2015 Normandy was divided into two administrative regions: Lower Normandy and Upper Normandy; the regions were merged into one single region on 1 January 2016. Upper Normandy (Haute-Normandie) consisted of the French departments of Seine-Maritime and Eure, and Lower Normandy (Basse-Normandie) of the departments of Orne, Calvados, and Manche. 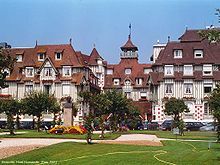 The historical Duchy of Normandy was a formerly independent duchy occupying the lower Seine area, the Pays de Caux and the region to the west through the Pays d'Auge as far as the Cotentin Peninsula. Western Normandy belongs to the Armorican Massif, whereas the major part of the region belongs to the Paris Basin. France's oldest rocks crop out in Jobourg in the Cotentin peninsula. The region is bordered along the northern coasts by the English Channel. There are granite cliffs in the west and limestone cliffs in the east. There are also long stretches of beach in the centre of the region. The bocage typical of the western areas caused problems for the invading forces in the Battle of Normandy. A notable feature of the landscape is created by the meanders of the Seine as it approaches its estuary. The highest point is the Signal d'Écouves (417m) in the Massif armoricain. Normandy is sparsely forested: 12.8% of the territory is wooded, compared to a French average of 23.6%, although the proportion varies between the departments. Eure has most cover (21%) while Manche has least (4%), a characteristic shared with the Islands. The pays d'Auge, central Normandy, is characterized by excellent agricultural land. The pays de Madrie, area between the Seine and the Eure. The Suisse Normande (Norman Switzerland), in the south, presents hillier terrain. Although the British surrendered claims to mainland Normandy, France, and other French possessions in 1801, the monarch of the United Kingdom retains the title Duke of Normandy in respect to the Channel Islands. The Channel Islands (except for Chausey) remain Crown dependencies of the British Crown in the present era. Thus the Loyal Toast in the Channel Islands is La Reine, notre Duc ("The Queen, our Duke"). The British monarch is understood to not be the Duke with regards to mainland Normandy described herein, by virtue of the Treaty of Paris of 1259, the surrender of French possessions in 1801, and the belief that the rights of succession to that title are subject to Salic Law which excludes inheritance through female heirs. The modern region of Normandy was created by the territorial reform of French Regions in 2014 by the merger of Lower Normandy, and Upper Normandy. The new region took effect on 1 January 2016, after the regional elections in December 2015. The Regional Council has 102 members who are elected under a system of proportional representation. The executive consists of a president and vice-presidents. Hervé Morin from the Centre party was elected president of the council in January 2016. Much of Normandy is predominantly agricultural in character, with cattle breeding the most important sector (although in decline from the peak levels of the 1970s and 1980s). The bocage is a patchwork of small fields with high hedges, typical of western areas. Areas near the Seine (the former Upper Normandy region) contain a higher concentration of industry. Normandy is a significant cider-producing region, and also produces calvados, a distilled cider or apple brandy. 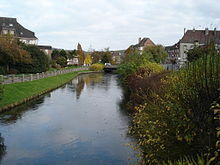 Other activities of economic importance are dairy produce, flax (60% of production in France), horse breeding (including two French national stud farms), fishing, seafood, and tourism. The region contains three French nuclear power stations. There is also easy access to and from the UK using the ports of Cherbourg, Caen (Ouistreham), Le Havre and Dieppe. In January 2006 the population of Normandy (including the part of Perche which lies inside the Orne département but excluding the Channel Islands) was estimated at 3,260,000 with an average population density of 109 inhabitants per km², just under the French national average, but rising to 147 for Upper Normandy. 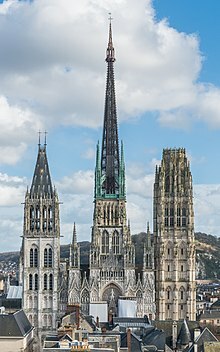 The main cities (population given from the 1999 census) are Rouen (518,316 in the metropolitan area), the capital since 2016 of the province and formerly of Upper Normandy; Caen (420,000 in the metropolitan area) and formerly the capital of Lower Normandy; Le Havre (296,773 in the metropolitan area); and Cherbourg (117,855 in the metropolitan area). The traditional provincial flag of Normandy, gules, two leopards passant or, is used in both modern regions. The historic three-leopard version (known in the Norman language as les treis cats, "the three cats") is used by some associations and individuals, especially those who support reunification of the regions and cultural links with the Channel Islands and England. Jersey and Guernsey use three leopards in their national symbols. The three leopards represents the strength and courage Normandy has towards the neighbouring provinces. The unofficial anthem of the region is the song "Ma Normandie". "Two-leopard" version, which is the main one. Flag used by the sailors of the Normandy. Flag used by the hometown of William the Conqueror. The Norman language, a regional language, is spoken by a minority of the population on the continent and the islands, with a concentration in the Cotentin Peninsula in the far West (the Cotentinais dialect), and in the Pays de Caux in the East (the Cauchois dialect). Many place names demonstrate the Norse influence in this Oïl language; for example -bec (stream), -fleur (river), -hou (island), -tot (homestead), -dal or -dalle (valley) and -hogue (hill, mound). French is the only official language in continental Normandy and English is also an official language in the Channel Islands. Architecturally, Norman cathedrals, abbeys (such as the Abbey of Bec) and castles characterise the former duchy in a way that mirrors the similar pattern of Norman architecture in England following the Norman Conquest of 1066. Domestic architecture in upper Normandy is typified by half-timbered buildings that also recall vernacular English architecture, although the farm enclosures of the more harshly landscaped Pays de Caux are a more idiosyncratic response to socio-economic and climatic imperatives. Much urban architectural heritage was destroyed during the Battle of Normandy in 1944 – post-war urban reconstruction, such as in Le Havre and Saint-Lô, could be said to demonstrate both the virtues and vices of modernist and brutalist trends of the 1950s and 1960s. Le Havre, the city rebuilt by Auguste Perret, was added to Unesco's World Heritage List in 2005. 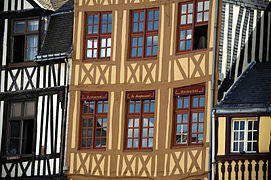 Vernacular architecture in lower Normandy takes its form from granite, the predominant local building material. 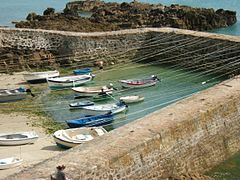 The Channel Islands also share this influence – Chausey was for many years a source of quarried granite, including that used for the construction of Mont Saint-Michel. 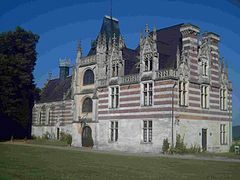 The south part of Bagnoles-de-l'Orne is filled with bourgeois villas in Belle Époque style with polychrome façades, bow windows and unique roofing. This area, built between 1886 and 1914, has an authentic “Bagnolese” style and is typical of high-society country vacation of the time. The Chapel of Saint Germanus (Chapelle Saint-Germain) at Querqueville with its trefoil floorplan incorporates elements of one of the earliest surviving places of Christian worship in the Cotentin – perhaps second only to the Gallo-Roman baptistry at Port-Bail. It is dedicated to Germanus of Normandy. Parts of Normandy consist of rolling countryside typified by pasture for dairy cattle and apple orchards. A wide range of dairy products are produced and exported. Norman cheeses include Camembert, Livarot, Pont l'Évêque, Brillat-Savarin, Neufchâtel, Petit Suisse and Boursin. Normandy butter and Normandy cream are lavishly used in gastronomic specialties. Fish and seafood are of superior quality in Normandy. Turbot and oysters from the Cotentin Peninsula are major delicacies throughout France. Normandy is the chief oyster-cultivating, scallop-exporting, and mussel-raising region in France. Normandy is a major cider-producing region (very little wine is produced). Perry is also produced, but in less significant quantities. Apple brandy, of which the most famous variety is calvados, is also popular. The mealtime trou normand, or "Norman hole", is a pause between meal courses in which diners partake of a glassful of calvados in order to improve the appetite and make room for the next course, and this is still observed in many homes and restaurants. 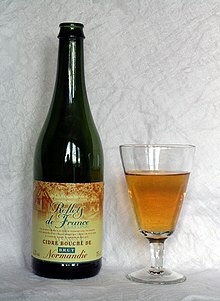 Pommeau is an apéritif produced by blending unfermented cider and apple brandy. Another aperitif is the kir normand, a measure of crème de cassis topped up with cider. Bénédictine is produced in Fécamp. Apples are also widely used in cooking: for example, moules à la normande are mussels cooked with apples, cream and cheese, bourdelots are apples baked in pastry, partridges are flamed with reinette apples, and localities all over the province have their own variation of apple tart, that is more popular named tan tan tan tan, because the people can't say the correct name "Tarte Tatin", a classic pastry dish from the region is Norman Tart a pastry-based variant of the apple tart. Other regional specialities include tripes à la mode de Caen, andouilles and andouillettes, salade cauchoise, salt meadow (pré salé) lamb, seafood (mussels, scallops, lobsters, mackerel...), and teurgoule (spiced rice pudding). Normandy dishes include duckling à la rouennaise, sautéed chicken yvetois, and goose en daube. Rabbit is cooked with morels, or à la havraise (stuffed with truffled pigs' trotters). Other dishes are sheep's trotters à la rouennaise, casseroled veal, larded calf's liver braised with carrots, and veal (or turkey) in cream and mushrooms. Normandy is also noted for its pastries. It is the birthplace of brioches (especially those from Évreux and Gisors) and also turns out douillons (pears baked in pastry), craquelins, roulettes in Rouen, fouaces in Caen, fallues in Lisieux, sablés in Lisieux. Confectionery of the region includes Rouen apple sugar, Isigny caramels, Bayeux mint chews, Falaise berlingots, Le Havre marzipans, Argentan croquettes, and Rouen macaroons. 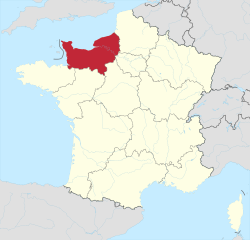 Normandy is the native land of Taillevent, cook of the kings of France Charles V and Charles VI. He wrote the earliest French cookery book named Le Viandier. Confiture de lait was also made in Normandy around the 14th century. The dukes of Normandy commissioned and inspired epic literature to record and legitimise their rule. Wace, Orderic Vitalis and Stephen of Rouen were among those who wrote in the service of the dukes. After the division of 1204, French literature provided the model for the development of literature in Normandy. Olivier Basselin wrote of the Vaux de Vire, the origin of literary vaudeville. Notable Norman writers include Jean Marot, Rémy Belleau, Guy de Maupassant, Jules Barbey d'Aurevilly, Gustave Flaubert, Octave Mirbeau, and Remy de Gourmont, and Alexis de Tocqueville. The Corneille brothers, Pierre and Thomas, born in Rouen, were great figures of French classical literature. David Ferrand (1591–1660) in his Muse Normande established a landmark of Norman language literature. In the 16th and 17th centuries, the workers and merchants of Rouen established a tradition of polemical and satirical literature in a form of language called the parler purin. At the end of the 18th century and beginning of the 19th century a new movement arose in the Channel Islands, led by writers such as George Métivier, which sparked a literary renaissance on the Norman mainland. In exile in Jersey and then Guernsey, Victor Hugo took an interest in the vernacular literature. Les Travailleurs de la mer is a well-known novel by Hugo set in the Channel Islands. The boom in insular literature in the early 19th century encouraged production especially in La Hague and around Cherbourg, where Alfred Rossel, Louis Beuve and Côtis-Capel became active. The typical medium for literary expression in Norman has traditionally been newspaper columns and almanacs. The novel Zabeth by André Louis which appeared in 1969 was the first novel published in Norman. Normandy has a rich tradition of painting and gave to France some of its most important artists. In the 17th century some major French painters were Normans like Nicolas Poussin, born in Les Andelys and Jean Jouvenet. Romanticism drew painters to the Channel coasts of Normandy. Richard Parkes Bonington and J. M. W. Turner crossed the Channel from Great Britain, attracted by the light and landscapes. Théodore Géricault, a native of Rouen, was a notable figure in the Romantic movement, its famous Radeau de la Méduse being considered come the breakthrough of pictorial romanticism in France when it was officially presented at the 1819 Salon. The competing Realist tendency was represented by Jean-François Millet, a native of La Hague. The landscape painter Eugène Boudin, born in Honfleur, was a determining influence on the impressionnists and was highly considered by Monet. Breaking away from the more formalised and classical themes of the early part of the 19th century, Impressionist painters preferred to paint outdoors, in natural light, and to concentrate on landscapes, towns and scenes of daily life. 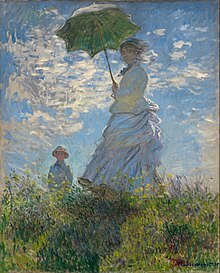 Leader of the movement and father of modern painting, Claude Monet is one of the best known Impressionists and a major character in Normandy's artistic heritage. His house and gardens at Giverny are one of the region's major tourist sites, much visited for their beauty and their water lilies, as well as for their importance to Monet's artistic inspiration. Normandy was at the heart of his creation, from the paintings of Rouen's cathedral to the famous depictions of the cliffs at Etretat, the beach and port at Fécamp and the sunrise at Le Havre. It was Impression, Sunrise, Monet's painting of Le Havre, that led to the movement being dubbed Impressionism. After Monet, all the main avant-garde painters of the 1870s and 1880s came to Normandy to paint its landscapes and its changing lights, concentrating along the Seine valley and the Norman coast. 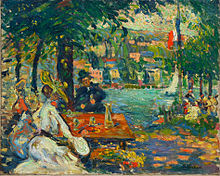 Landscapes and scenes of daily life were also immortalised on canvas by artists such as William Turner, Gustave Courbet, the Honfleur born Eugène Boudin, Camille Pissarro, Alfred Sisley, Auguste Renoir, Gustave Caillebotte, Paul Gauguin, Georges Seurat, Paul Signac, Pierre Bonnard, Georges Braque and Pablo Picasso. While Monet's work adorns galleries and collections all over the world, a remarkable quantity of Impressionist works can be found in galleries throughout Normandy, such as the Museum of Fine Arts in Rouen, the Musée Eugène Boudin in Honfleur or the André Malraux Museum in Le Havre. Maurice Denis, one of the leaders and theoricists of the Nabis movement in the 1890s, was a native of Granville, in the Manche department. The Société Normande de Peinture Moderne was founded in 1909 by Pierre Dumont, Robert Antoine Pinchon, Yvonne Barbier and Eugène Tirvert. Among members were Raoul Dufy, a native of Le Havre, Albert Marquet, Francis Picabia and Maurice Utrillo. Also in this movement were the Duchamp brothers, Jacques Villon and Marcel Duchamp, considered one of the father of modern art, also natives of Normandy. Jean Dubuffet, one of the leading French artist of the 1940s and the 1950s was born in Le Havre. Christian missionaries implanted monastic communities in the territory in the 5th and 6th centuries. Some of these missionaries came from across the Channel. The influence of Celtic Christianity can still be found in the Cotentin. By the terms of the treaty of Saint-Clair-sur-Epte, Rollo, a Viking pagan, accepted Christianity and was baptised. The Duchy of Normandy was therefore formally a Christian state from its foundation. The cathedrals of Normandy have exerted influence down the centuries in matters of both faith and politics. King Henry II of England, did penance at the cathedral of Avranches on 21 May 1172 and was absolved from the censures incurred by the assassination of Thomas Becket. Mont Saint-Michel is a historic pilgrimage site. Thérèse de Lisieux whose birthplace in Alençon and later home in Lisieux are a focus for religious pilgrims. Since the 1905 French law on the Separation of the Churches and the State there is no established church in mainland Normandy. In the Channel Islands, the Church of England is the established church. World War II 15 cm TbtsK C/36 German coastal gun. ^ "Norman". Online Etymology Dictionary. Retrieved 1 April 2010. ^ Michel Badet (29 May 2010). "Découvertes touristiques Cap Breizh – Les îles Anglo-Normandes". 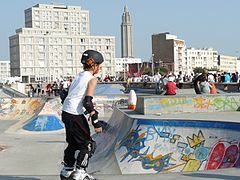 capbreizh.com. Retrieved 8 October 2010. ^ "Provides the full title of the British Monarch". ^ "César et les Gaulois" (in French). pagesperso-orange.fr. ^ Neveux, Francois. The Normans: The conquests that changed the face of Europe. p. 48. ISBN 978-0-7624-3371-1. ^ Emmanuel Le Roy Ladurie (1987). The French Peasantry: 1450-1660. University of California Press. p. 32. ISBN 978-0-520-05523-0. ^ Bay of Écalgrain and Bay of Cul-Rond Website Lithothèque de Normandie. ^ "Channel Islands". The official website of The British Monarchy. Retrieved 20 July 2015. ^ Baron de Montesquieu, M. de Secondat (1873). The Spirit of Laws: Translated from the French of M. de Secondat, Baron de Montesquieu by Thomas Nugent, LL.D. ROBERT CLARKE & CO. p. 328. Retrieved 2 February 2019. It would be easy for me to prove that the Salic law did not absolutely exclude the daughters from the possession of the Salic land, but only in the case where they were de barred by their brothers. This appears from the letter of the Salic law ; which after having said, that the women shall possess none of the Salic land, but only the males, interprets and restrains itself by adding, "that is, the son shall succeed to the inheritance of the father." ^ "La carte à 13 régions définitivement adoptée" (in French). Le Monde. Agence France-Presse. 17 December 2014. Retrieved 13 January 2015. ^ Houses and properties for sale. Normandy Property. Retrieved on 19 September 2014. 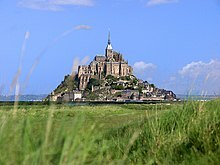 ^ "France in CIA factbook"
^ "The Vikings in Normandy: The Scandinavian contribution in Normandy". ^ "Norman cheeses: History". fromages.org. 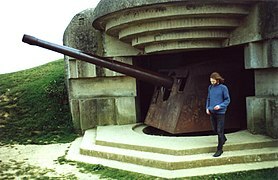 Wikimedia Commons has media related to Normandy. Wikisource has the text of the 1905 New International Encyclopedia article Normandy.